"For the past eight years I have been guiding sea kayak expeditions on the east coast of Greenland. This area and mode of exploring is extremely demanding on kit ... your life depends on your equipment ... should something fail … there is no chance of replacing it ... Previously … should the kayak be damaged by ice, the risk of the sleeping bag getting wet was always a worry ... [until in 2014 Martin took 2 PHD bags: a Minimus and a Minim Overbag to fit over it, so] … Stowing them in separate compartments reduced the chance of them both getting wet." Technical Note: Martin’s very practical idea here (separating essential items so that one single mishap doesn't leave you in serious trouble) applies to other outdoor ventures at many levels. And to make use of the idea you've got to start with a spread of kit that gives you versatile choices: exactly what Sleep Systems offers. For the past eight years I have been guiding sea kayak expeditions on the east coast of Greenland. This area and mode of exploring is extremely demanding on kit. Like the big mountain ranges of the world your life depends on your equipment and stores, should something fail or not come up to scratch, there is no chance of replacing it. 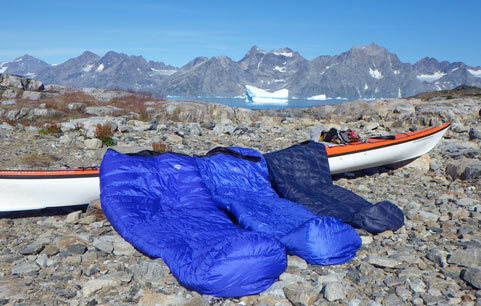 The choice of sleeping bag insulation material for a sea kayak expedition is often debated. Due to the demands on restricted storage, I have always elected to use a down filled bag. Even in the summer, Greenland nights get cold with temperatures often dropping to -5 or below. Given that we don't eat as well as we should during extended expeditions, it’s important to save energy by being warm at night. Previously I have used to good effect a 4 season expedition bag. However, its biggest shortcoming was that it required significant effort to stuff it into suitable dry bags. It also took up a considerable amount of space in the kayak's watertight compartment. Although always double bagged, should the kayak be damaged by ice, the risk of the sleeping bag getting wet was always a worry. No one I know goes hiking in a big thick woolly jumper, so applying the layering principle to sleeping bags makes as much sense as it does for clothing. So after discussions with Peter Elliott at PHD, I switched systems and this past summer used the PHD Minimus and PHD Minim Overbag sleeping bags. Immediately the benefits became obvious. Two smaller bags took up about the same space as my old bag, but were considerably easier to pack into dry bags each morning. Stowing them in separate compartments reduced the chance of them both getting wet and made packing the kayak much easier with less wasted space. Both my bags were made without zips, which I must say I initially regretted and it took some getting used to. However the reduced weight and bulk is worth it and I am now a convert. Some of our camps were by the very nature of the trip close to the water and fjords full of pack ice. When the wind was from the sea, these nights were very cold and I was very glad of both bags – in theory either bag should be suitable on its own, however I do sleep cold and was pretty run down by this stage. Polar bears are a hazard and we take it in turns to do an hour's watch at night. This quickly cools you down and being able to get back into a good warm sleeping bag is then even more important. It must also be noted that on other occasions when conditions were more settled the inner bag was more than sufficient on its own – at these times I didn't even unpack the second bag from the kayak, thus saving time and energy the following day. On occasion the outer bag was also used on its own. As this bag is larger inside it takes a bit more to warm it up, but if ever chilly, rather than get the inner bag out I was happy to just stuff a down jacket inside and always slept well. Being able to slide either the inner bag down round your legs or the outer bag off made regulating your temperature easy on warmer nights. The quality of the insulation and fabric materials were light weight but strong and proved hard wearing and I was very impressed with the system. It's now so obvious - I can't believe it's taken me 30 years to apply this layering principle to my sleeping system. Looking forward to some good sleeps next season thanks to PHD.